Brimming with Venezuelan color and an array of tasty arepas, Puyero Venezuelan Flavor has been busy making its mark on South Street for the last year. 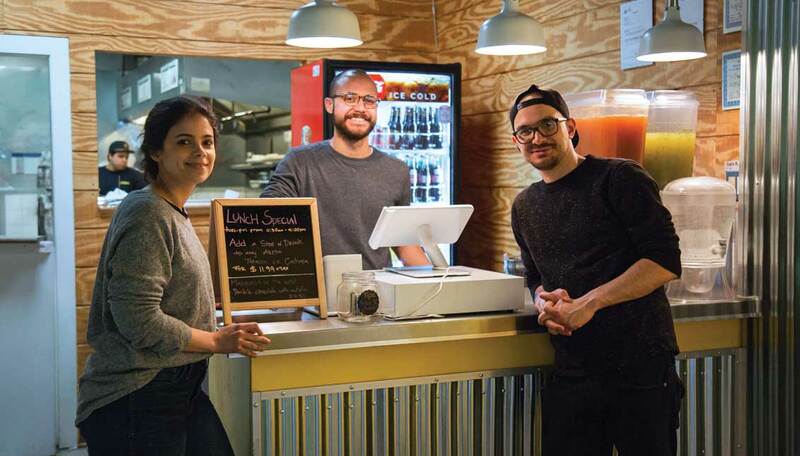 It all got started when brothers Simon and Gil Arends, alongside Gil’s wife Manuela Villasmil, decided to bring a taste of Venezuelan street cuisine to the city in early 2017. The three are all originally from Venezuela but have a long history with the United States. Gil and Simon went to the American School in Maracaibo, an important oil town in their native country that holds offices for Chevron and Shell. As children, they traveled to Philadelphia every year during the summer or Christmas vacations to visit an aunt who lived near the Benjamin Franklin Parkway. After high school, Gil came back to Philly to obtain an associate’s degree, but decided to return to Venezuela where he completed his undergrad in Law and met Manuela. However, with the dictatorship of Hugo Chavez consolidating power, limiting opportunity and subjecting much of the country to poverty, the couple decided to move back to Philadelphia in 2010 when Gil had the opportunity to complete a master’s degree in Law at Temple University. While in Philly, Gil and Manuela enjoyed the food scene, but noted its lack of Venezuelan options. For years they thought about opening their own place, but it was not until Simon moved here to work as an architect in 2015 that they finally decided to put their plan into action. In early 2017, they finally opened with the goal of sharing Venezuelan culture with the city. In that vein, the restaurant has been constructed to evoke their hometown of Maracaibo. With the help of a graphic design team in Venezuela, the interior was designed to resemble the typical houses that shine brightly in the sun in the Venezuelan city with colorful tables and bright multi-hued walls. The owners of Puyero specifically chose South Street for the location, drawn by its youthful environment and bustling, vibrant atmosphere not too different from the street life in Venezuela. The main interior wall is outfitted with funny quotes to resemble what you would commonly overhear walking the streets in Venezuela. Most of the featured quotes are food-related, such as, “barriga llena, corazón contento” (full belly, happy heart) and “más hambre que piojo en peluche” (hungrier than a tick on a teddy bear). Another quote features the restaurant’s namesake — “gozando un puyero,” a phrase meaning “to have a ton of fun.” The word “puyero” comes from the word “puya,” which was the name of the penny in Venezuela in the early 20th century. Like kids in a candy shop, customers at Puyero are faced with a colorful array of tempting food options to choose from. The specialty is the arepa, a cornmeal sandwich stuffed with various fillings, such as chicken, pork and beef. The arepa originated hundreds of years ago in the regions of Colombia and Venezuela. Indigenous tribes would cook masa bread from cornmeal. The name comes from the indigenous word “erepa,” their word for pita. Initially, the dish was only bread, but in the 1950s, Areperías (places that served arepas) gained popularity and started creating their own unique, innovative fillings. Among the most popular items at Puyero are the Reina Pepiada (shredded chicken mixed with avocado and gouda cheese), the Special Domino (black beans, avocado, sweet fried plantains and white cheese) and the Pabellón (shredded beef, black beans, fried sweet plantain, and white cheese). All the food is prepared in house, even the cornmeal shell, which is created with arinapan, the same ingredient used in Venezuela. Making quality food resembling the offerings in Venezuela is of the utmost importance, and not one detail is left out. The mastermind behind the dishes is Manuela, who derived her skills from her mother, a pastry baker in Venezuela. At the core of the meat and chicken fillings is a base called sofrito, which is a mix of veggies, onion, tomato and peppers commonly used in Venezuela that adds a richer, fuller flavor. For sides, they offer the classic Venezuelan tequeños (deep fried dough wrapped around white cheese), but they have also made an effort to include specialties from their hometown of Maracaibo, such as mandoca, a cornflower and plantain mix, deep-fried with cinnamon, topped with white cheese and cream, as well as pan-con-queso, a hot dog topped with ketchup, mustard, green mayo, white cheese, green cabbage and crisps. To quench your thirst, they offer papelón, a drink prepared with melted sugar, water and lemon, as well as cilantro lemonade and chicha, a rice based milkshake. Offering food both unusual and innovative in the city of Philadelphia, it has been quite popular with the locals, introducing a distinct taste to Queen Village. “The people are super nice and will help you choose your meal if you’ve never had Venezuelan fast food before,” raved Carlos B. on Yelp. “SANDWICHES WITH FRIED PLANTAINS AS BREAD. Seriously, what more could you ask for in life? !” added Renea R.
Apart from classic Venezuelan street food, the trio also likes to dabble in innovative cross-cultural specialties of their own, adding their special sauces to hamburgers or concocting new, original arepas. For example, to celebrate the Eagles’ Super Bowl victory they created a special green arepa, adding spinach to the reina pepiada chicken filling. For Valentine’s Day, they devised a red arepa filled with beets. Moving forward, the restaurant is planning to hold brunches with special breakfast arepas on weekends. Also in the works are special events where they can teach customers to make Venezuelan food on their own. Last Christmas, Puyero held an event specifically for bloggers about how to make hallaca, a special Christmas dish made with cornmeal, meat, raisins and olives. This year they hope to open up the event to the public, where everyone can gather together to make the dish like families at Christmas. The owners of Puyero celebrated the restaurant’s one year anniversary in March. For more information on Puyero Venezuelan Flavor and its latest culinary concoctions, check out Instagram (@puyeroflavor) or the restaurant’s website (puyeroflavor.com). Puyero is open from 11:30 a.m. to 10 p.m. Tuesday through Thursday, 11:30 a.m. – 11 p.m. Friday and Saturday, and open Sundays from 11:30 a.m. to 10 p.m.